Though it’s often called “The Whale”, Cetus is named for the terrible sea monster from Greek mythology who was slain by Perseus as he rescued the Princess Andromeda who had been sacrificed to appease the wrath of the sea god Poseidon. The constellation Cetus is in the southern sky, just south of the zodiac constellation Pisces. Lacerta, the lizard, is a faint constellation. As such, it was not established as a constellation until it was created by Johannes Hevelius in 1687. It’s faint zig-zag shape is a challenge to pick out in the sky. Though it is faint, it lies partially in the Milky Way, so is densely populated with stars on one side. The name Ophiucus comes from Greek and means serpent-bearer. This constellation goes hand-in-hand with the constellation Serpens—a constellation that is uniquely divided into two parts, the head and tail of the serpent, on either side of Ophiucus. 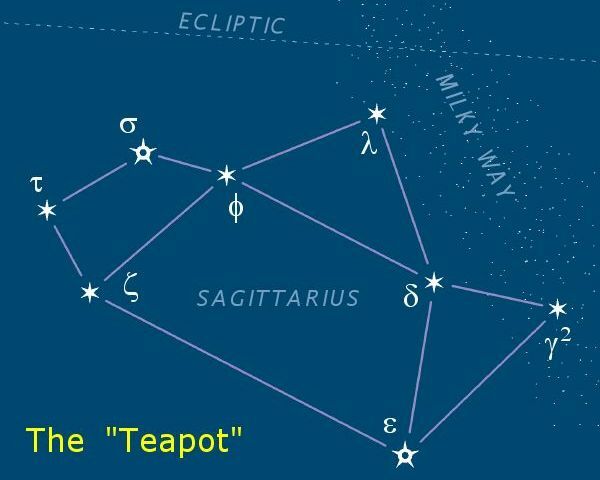 The ecliptic actually runs through the very southernmost part of the area of sky defined as this constellation, making it—technically—a zodiac constellation. Piscis Austrinus, or Southern Fish, is a mostly dim constellation, but you can’t miss its brightest star Fomalhaut—it’s one of the brightest stars in the sky! The name Fomalhaut comes from Arabic, and means “mouth of the whale”. Piscis Austrinus is best viewed form the Southern Hemisphere, but is easily visible from most Northern Latitudes. Triangulum is a small and simple constellation, and perhaps the only constellation that truly looks like its namesake—a triangle. Within the boundaries of the constellation lies one of our nearest neighbor galaxies—a galaxy known as the Triangulum Galaxy (Messier 33). At only 3 million light-years away, Triangulum is one of our closest neighbors. NGC 7009 is planetary nebula in Aquarius with a greenish-yellowish hue. It was formed by a low-mass star ejecting its outer layers into space. The central star is now a tiny white dwarf star with a surface temperature of 55,000 K, ionizing the expelled outer layers with its UV radiation. The green color is caused by double-ionized oxygen. It was named “The Saturn Nebula” by Lord Rosse in the 1840s, when telescopes had improved to the point that its Saturn-like shape could be discerned. Neptune, eighth planet from the Sun, is a blue “gas giant” about 4 Earth-diameters across. At least 14 moons orbit Neptune. Galileo accidentally observed Neptune in 1612 and 1613 but did not realize it differed from the stars—its true discovery would wait until 1846. 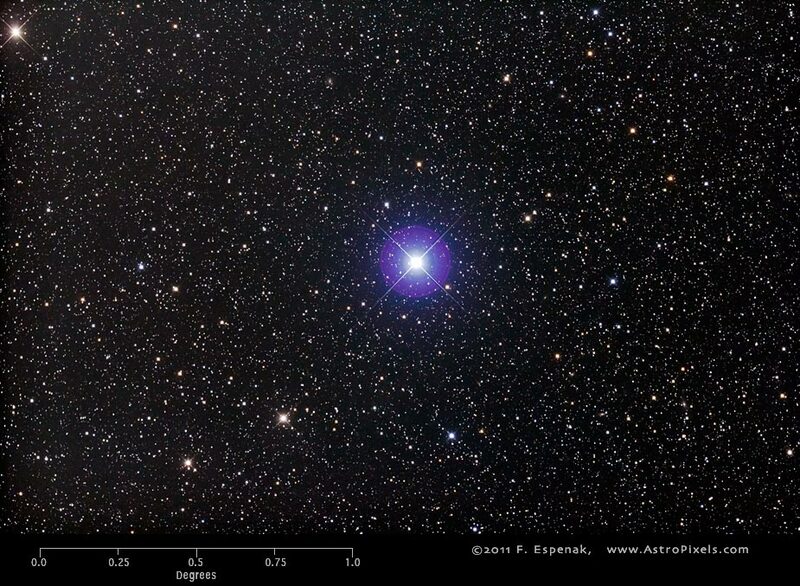 Algol is a famous variable star. The Arabic name, “al Ghul” (related to the English “ghoul”), means “the demon.” It comes from a longer phrase that refers to the demon’s head. In Greek mythology, the star Algol represented the head of Medusa, held up by Perseus’s fist. To the eye, this star appears slightly bluish white. Close observation will reveal an interesting characteristic. Every 2.9 days, the brightness of Algol drops to just 30 percent of normal. The drop in brightness lasts only a few hours. This variation in brightness may be the reason the star was once considered to be unlucky. The cause of the variation in brightness is a stellar eclipse. Algol is a close double star whose components orbit each other every 2.9 days. Its companion is much fainter than Algol itself, but is actually larger in size. When it passes in front of Algol, it eclipses the light of the brighter companion.